You’ve heard the stereotypes before. Smoking pot makes you fat and lazy. You have one choice, quit weed and get in shape, or keep smoking and doom yourself to a life of watching TV and eating Doritos on the couch. 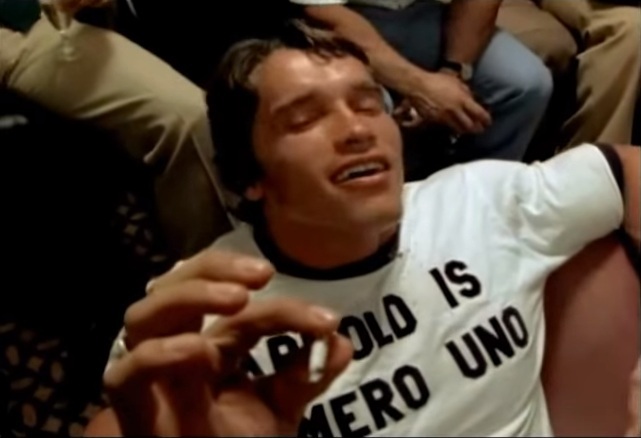 That’s Arnold Schwarzenegger toking up back in his Mr. Universe days. So, if pot really made people fat and lazy, why do people like the “strongest man alive” keep getting ripped in more ways than one? This is something that certain athletes, particularly in extreme sports like snowboarding and skating, have know for a long time. Getting high can helps put you into a place commonly referred to as “the zone,” or a state of zen focus, that drops everything else from the mind. In 2015, Journalist Gordy Megroz, set out to test the effects of marijuana on exercise and found some surprising results. He discovered a fact that scientists have been slowly piecing together. That the so-called “runners high” experienced by athletes for hundreds of years is incredibly similar to your average weed high. This is a result of the human endocannabinoid system, which releases small amount of THC when the body starts to burn fat. So when you get high and work out, you’re actually speeding up the process of getting into the zone. Contrary to who traditional knowledge, pot doesn’t have to make you lazy and lethargic. There are many different strains that produce different highs. The most common distinguishing factor is indica vs. sativa. For the purposes of exercise, sativa heavy strains are the way to go. Indica dominant plants tend to have stronger effect on the body, producing a relaxing effect that may leave you couch ridden. Sativas, on the other hand, go straight to the head to produce a euphoric and energizing effect. This makes them perfect for getting out of the house and into the gym. For an excellent sativa high to keep you up and running, The Pot Vault recommends the Blue Hawaiian strain. Yes, really. Even though the most commonly cited side effect of marijuana is the Munchies, that pesky habit that pot has of making you hungry for everything, there is evidence that it actually reduces fat in your body. A recent study revealed that there is significant drop in the levels of Fasting Insulin (insulin in your body before you eat) in the bodies of weed users. Insulin helps convert calories into energy, and the lower the levels, the less food is stored in your body as fat. In fact, they “found significant associations between marijuana use and smaller waist circumferences.” Long story short, pot can speed the fat you burn. Muscle growth occurs when tears in your muscles rebuild stronger after use. Once again, the ever-present endocannibinoid system dominates this process. An active ingredient in marijuana is CBD. Research shows that this chemical acts as an anti-inflammatory and speeds up muscle recovery. This means it reduces soreness and cuts the time you need to wait between each workout! Marijuana has well established effects on pain relief and nausea. So how does it apply to exercise science? Let’s go back to that “zone” that athletes talk about. Working out hurts. The less pain you feel, the longer you fight through it, and the better your workout is going to be. Before you go out, take a few bong rips, and hit the gym, there are still some things you should know. Marijuana is still proven to reduce reaction time and alertness. And don’t forget about those munchies that can still build fat if you eat the wrong thing. With that in mind, remember to be careful and eat healthy before you toke. Good luck on the gains!